Now we have come to a movie I really love, Dumbo. It’s one I don’t recall seeing as a child and always dismissed as ‘the sad Disney movie’. Boy was I missing out. Dumbo is not only lovely but has an interesting backstory. Released in 1941 the Disney studios needed a hit after flops of Pinocchio and Fantasia. War and high production costs had made the budget on both pictures balloon. Walt told his animators they need a film that would be cheap to produce and box office friendly. A merchandise director showed him a storyline for a toy called The Roll-a-Book about an elephant who could fly. Walt Disney loved the idea and they went right to work with budget being the priority. What’s amazing about that is even with so many restrictions they still managed to produce art and take risks that make Dumbo very special. At it’s core Dumbo is about overcoming differences and finding true friends. (and never discounting someone as a friend because of those differences). Of all the Disney ‘messages’ it is one of my favorites. Each character is vividly portrayed because the backgrounds and other visuals were simple allowing the eyes and other body parts to be especially expressive. 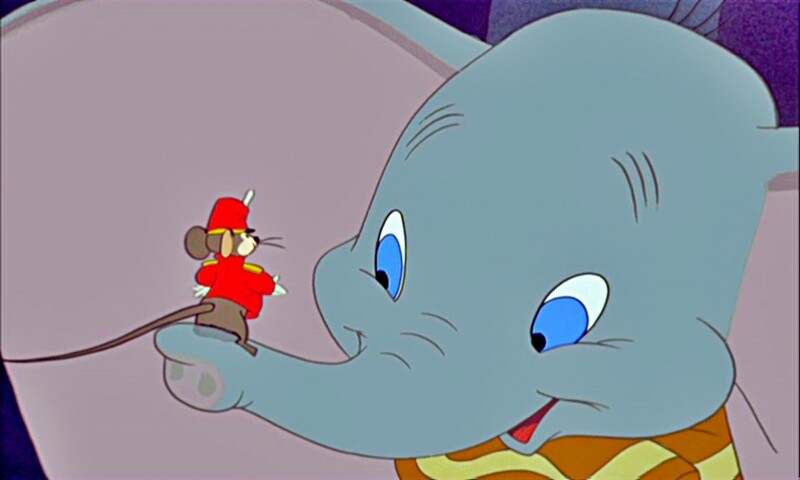 Outside of Timothy Q Mouse and the crows there is remarkably little dialogue in Dumbo, but we don’t notice it because meanings and emotions are very clear. There was a strike while Dumbo was in production which was very demoralizing for Walt and Roy Disney. He had felt like a family to the animators and as a subtle jab in the clown scenes several of the strikers are depicted. The war also affected Dumbo. Time magazine was going to name Dumbo ‘mammal of the year’ and have him on the cover but the bombing of Pearl Harbor superseeded it although the article was still listed. No doubt the new war made a sentimental tale about friendship extra appealing. Dumbo cost half the price of Snow White and a third of Pinocchio so they succeeded in their budgeting for once. The story is pretty simple. Dumbo is delivered by the stork and he has huge ears! The lady elephants are horrified and call him Dumbo instead of Jumbo Jr as his Mother wants. Little boys make fun of Dumbo which makes his mother angry and she storms them and is locked up. The circus owner decides to create a pyramid of elephants with Dumbo at the top as the smallest elephant. Unfortunately Dumbo slips and everything comes crashing down. Dumbo gets sent to work with the clowns as punishment and the elephants decide he is ‘no longer an elephant’. Dumbo cries and takes him to see his mother where she sings to him ‘Baby of Mine’ . Here’s where things get strange. After the song Dumbo gets the hiccups and they drink some water not realizing it is actually champagne from the clowns. This starts a surrealist dream sequence called ‘Pink Elephants on Parade’. 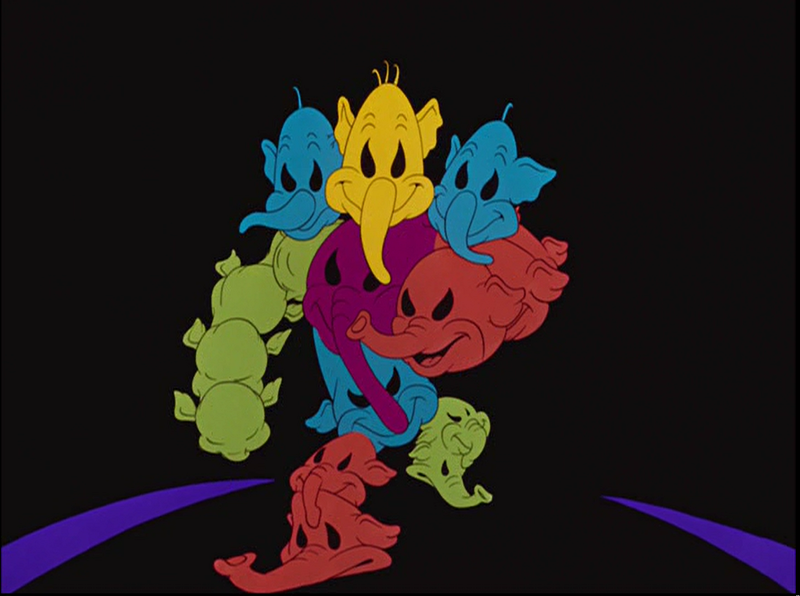 I love that in Disney’s low budget, safe movie they have something that out there as the pink elephants on parade. It’s like they couldn’t help themselves but be artistic and take risks. They will channel a similar surrealism in 1968 in The Many Adventures of Winnie the Pooh when Pooh dreams of Heffalumps and Woozles. When the 2 wake up they find themselves amazingly on top of a tree high in the air. How did they get there? Timothy figures they must have flown. There are some who claim the crows are racist. I actually find the song at the beginning called Song of Roustabouts to be more questionable with black men with no facial expressions doing physical labor. The crows are friendly, happy, characters who in the end help Dumbo. I don’t see them as any different than the vultures in Jungle Book and nobody complains they are racist? They do speak in a stereotypical way and use some halting language, but I don’t think it is demeaning or cruel. Perhaps I am wrong on that but it seems a bit of a nit-pick. Eventually Dumbo realizes he can fly and he returns to the circus becoming a star along with his true friend Timothy. 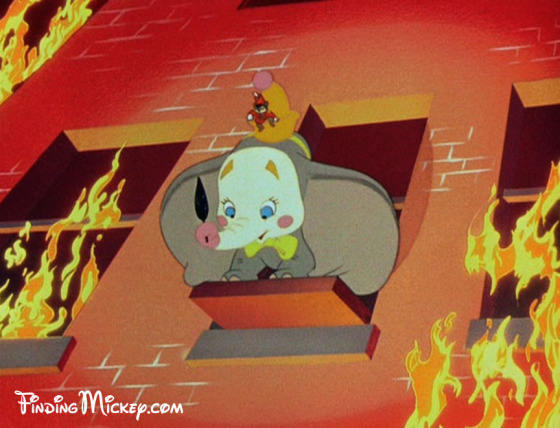 As we can see in the picture above most of the backgrounds in Dumbo are solid colors or painted in watercolor. This is only done in 2 other Disney movies- Snow White and 2002’s Lilo and Stitch. It is only 64 minutes long so Disney’s shortest theatrical release and it has relatively few characters. None of the voice talent was even credited at the end of the movie. I love stories that have a real heart to them and Dumbo certainly has that in spades. Amazing to have a lead character who doesn’t have one line of dialogue can be that appealing and sweet. Timothy Q Mouse is the real hero of the movie who doesn’t let the discrimination and hate of other people influence his thoughts and actions. It probably has more tears than in any other Disney movie but I feel the tears are earned because we see what is happening to a character that is a baby. I like to think that every person has someone in their life who is their unabashed cheerleader. We all get tough talk in spades but the people I treasure most are those that love me and think I am a one of a kind. My Grandfather was that person for me and Timothy Q Mouse is that person for Dumbo. I love that. It’s also an interesting depiction of both the joy of maternal love and the pettiness of a sorority mentality. I love stories about friendship and Dumbo certainly gives us a great one and reminds us friendship can come from the most unexpected sources. It also teaches what is seen as a drawback to others, is actually what makes us special and unique. When Dumbo embraces his ears instead of hiding them he is embracing his nature and is happy. The world recognizes him for that. If he had stayed in a corner in fear that would have never happened. And of course I love the fact that in the middle of all this sentiment we get something as jarring and nuts as Pink Elephants on Parade. These early films from Disney are art that happens to have an audience. It’s like they couldn’t help themselves but explore new genres and push boundaries. It’s awesome. Some are bothered by the crows and I respect that but it is honestly a short segment an could be fast forwarded if you prefer. 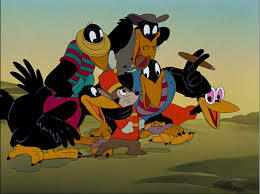 I think most kids are likely to just laugh at the crows cheerful goofy antics. If not, perhaps it can be used a teaching opportunity about the type of stereotypes and caricatures in all eras of art, music and storytelling. It seems a shame to throw away a wonderful film about accepting differences and loving all people because of a positive happy song by crows. Nevertheless, I think Dumbo is great for kids of all ages with perhaps the pink elephants scene skipped for very young children. Also, talking about Dumbo and Timothy getting drunk may need to take place after the scene is over. If I were to dock it a little it would be the songs aside from Baby Mine aren’t especially memorable although the score by Oliver Wallace and Frank Churchill is lovely (Oscar winning). Still, music-wise it would rate fairly low in the Disney cannon. Other than that, I really do love Dumbo. It is a weird, sweet, sad, tender-hearted tale of an elephant with really big ears! It’s a great film and I’ve never found the Crows to be offensive. I don’t even find the Roustabouts offensive. They’re hard workers and their song is epic! And not having expressions drawn on their faces is more of an artistic choice than a social one; it helps set the mood for the setting up of the circus in the middle of the night. I’m not offended by them. I just think someone could make a stronger case for the roustabouts but I always hear the crows cited as Disney racism instead. I know people who won’t watch the film because of the crows, which to me is a real shame. But then again I am not part of a minority, so I don’t know how I would respond to things. Always want to be sensitive with such issues, but I really do think it is overblown. I find the Crows to be quite likeable characters, so it’s difficult for me to say they are “offensive.” But then again, I’m not offended very easily, so perhaps I am desensitized on the matter. I agree this movie is one of Disney’s saddest, an element both of us liked in our reviews, but I guess where we differ is on the title character himself. I’ve loved characters who barely speak–WALL-E comes to mind–but Dumbo seemed more like a sympathetic figure to me than an actual character. One we care for not because of who he is, but because of what has happened to him. This is actually one of gripes on Quasimodo from The Hunchback, and I’m wondering what you think about him (do you like him as well?). Still, I’m happy you liked Dumbo! I just saw this comment. Sorry for not responding yesterday. I think it is better to not be offended easily. We miss out on so much when we are. Like with Dumbo people who refuse to see it because of the crows miss out on a movie which is truly about accepting those with differences and embracing diversity. You make a good point about characters who can’t speak. I don’t see that as an objection in my review but if I gave that impression it is not the case. If the writing is good I like a character who talks a lot such as Sebastian or Timothy Q Mouse. If the story is good and character well portrayed I like a character who doesn’t say much like Dumbo or Ariel (for most of Little Mermaid at least). There is actually not a ton of dialogue in Dumbo to begin with and I think that fits the air of a circus performance and the overall feel of the movie. I agree with you about WALL-E. If anything that movie is weaker when we get the human talking characters (but still great). It just depends. As far as Quasimodo I liked the character. My issues withe film have nothing to do with him. I love his song Out There because he doesn’t speak much and it is one of the only songs from a musical (not just Disney) which sounds like a real non-professional person singing it. I love it. I am not crazy about the tonal shifts and violence in the movie but you can read more about that in my review. As far as Quasi he is a very sympathetic, sweet character. It makes me sad people discount Dumbo because it’s a ‘sad movie’. I’ve heard that so many times. I like movies about the human experience (even if told through animals) and sadness is a part of life. It’s not manipulative like say a Nicholas Sparks movie and Dumbo gives you moments of joy too. I think people who skip it really miss out. Pingback: Disney Over/Under | Reviewing All 54 Disney Animated Films And More! Pingback: Disney Best Side Characters | Reviewing All 54 Disney Animated Films And More! I always found it strange that the Crows were the subject of racial controversy while the Roustabouts scene was probably much more questionable. At least the Crows apologized and HELPED Dumbo to get out of his bind. Another thing that always puzzled me somewhat since I was young was that we never got to see more circus animal characters, I mean we have lions, tigers, zebras, giraffes, hippos, kangaroos, bears, camels, horses, monkeys, ostriches and a gorilla! 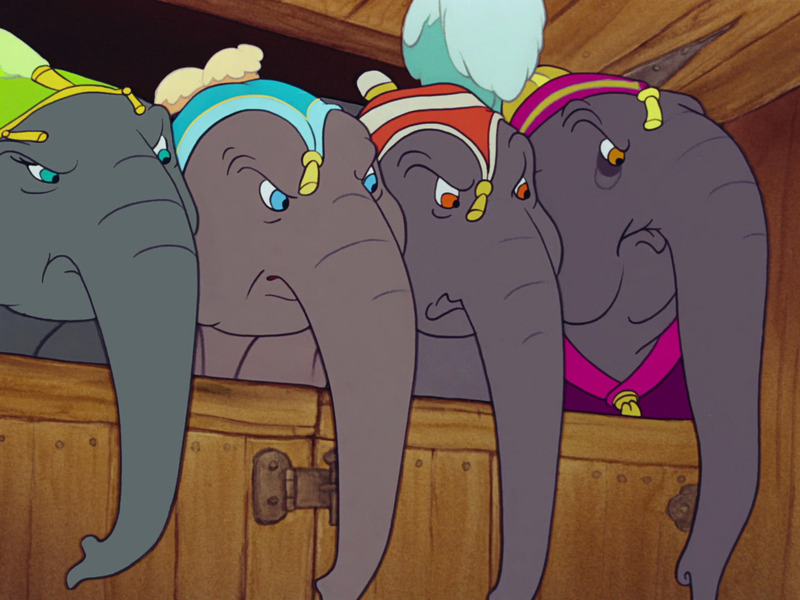 I almost wonder what kind of direction the story could have gone in if it had more time for Dumbo to interact with the other animals, ideally finding that not all of them are as rude as the other elephants. That might have taken away some focus, but I dunno. People seem to really love the Pink Elephants segment, I think its a little overrated. I mean it is a great feat of surreal animation, but to me it always came second to the relationships between Dumbo, Timothy and Mrs Jumbo, and as far as emotional scenes go ‘Dumbo’ has it in SPADES! I still can’t watch the ‘Baby Mine’ scene without welling up, and trying not to let other people see me! To say I’m not looking forward to Tim Burton’s take on Dumbo is an understatement. I’ve never been too crazy for his work, and seeing him tackle a film that’s very close and personal to me has alarm bells going off everywhere. If it was made to be similar to ‘Big Fish’ from 2003 and less like ‘Dark Shadows’, maybe it could work, but he’s been spiraling down for years now. A lot of great stuff in that comment. I agree on the roustabouts. I think they are more offensive stereotypes than the crows but I am not black so perhaps I am not sensitive to what that culture experiences when watching the crows. Either way it seems a shame for a movie that is about accepting people that are different to be tossed aside as racist. If I had kids I would talk about it and use it as a learning opportunity but also share the positive message of the movie. I like the pink elephants on parade segment just because it is so out there and different. If it was longer it might annoy me more but I also do think it comes second to the relationships as you say. I love Timothy Q Mouse and Dumbo and Mrs Jumbo just like you do. I cry at Baby Mine and I feel like for some people that’s a bad thing. Crying just means the movie is moving you emotionally. Why in the world would that be bad? I 100% agree on the Tim Burton Dumbo….of all the live action remakes (which I am not a fan of in general) the Dumbo I like least of all. I will go with an open mind but I am so over Tim Burton and Dumbo is only 60 minutes long so you know they are going to puff it up with junk. Sigh…I mean look what he did to Alice in Wonderland and that could have been cool. Dumbo? I am very skeptical! If a film can encourage smart discussion on themes of race and prejudice in real life, then it must be a good thing. It’s not that I feel guilty to cry at the ‘Baby Mine’ scene, but I tend to project the image of a fairly reserved, self-contained person. If I’m sufficiently upset or moved to tears then I will show it. The handful of live action Disney remakes I’d be reasonably open to are The Black Cauldron, Pete’s Dragon, Mulan (could be epic like Braveheart in its battle scenes and having an inspirational heroine) and Aladdin (could be really charming and visually beautiful, but I’d be skeptical about how they’d do Genie). Dumbo is too focused on animals to truly work in live action; at least The Jungle Book has Mowgli and other human characters to work with. Pingback: The Disney Era Tag: Golden Era | Reviewing All 54 Disney Animated Films And More! Pingback: Pixar Review 35: The Good Dinosaur | Reviewing All 54 Disney Animated Films And More! 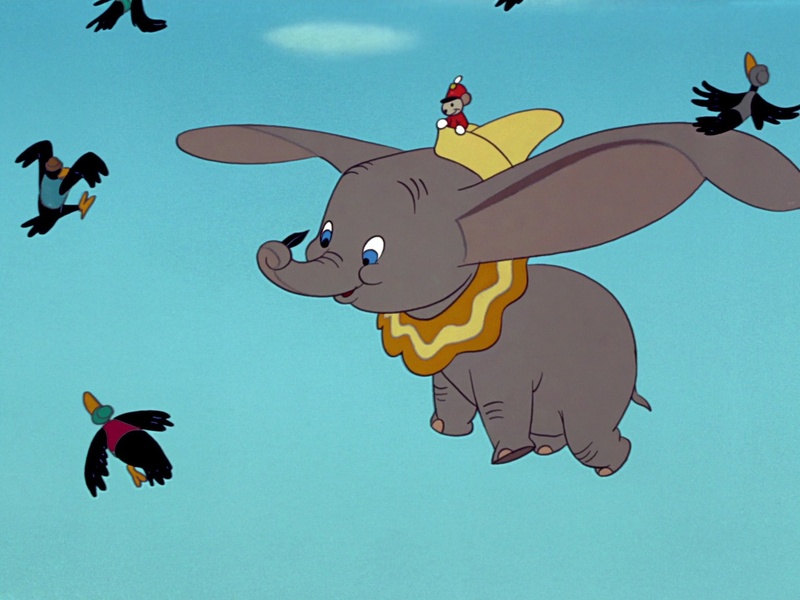 Dumbo’s ears are much like Rudolph’s nose; once he uses them to fly, he wins the respect of those who initially teased him. Plus his mother is released from her cage & they are reunited. Oh, & I found another broken vid here. Thanks. There are a bunch of those broken vids. Sorry about that. I was new to review blogging and I haven’t had to time to go back and fix all of those. Will do it soon. Hopefully you still got something out of the review. I can see the connection between Dumbo and Rudolph. I wouldn’t have thought of that! 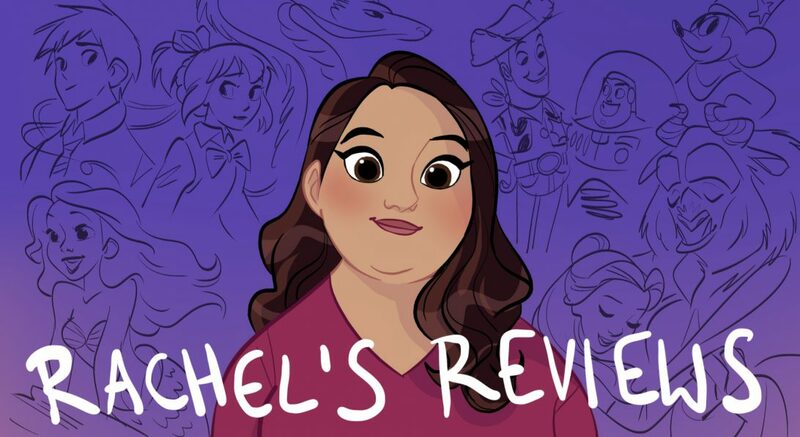 Pingback: Rotoscopers, Little Mermaid Tag, and Dumbo | Reviewing All 54 Disney Animated Films And More! Pingback: Where Have the Kids Movies Gone? – Reviewing All 56 Disney Animated Films And More! Another interesting review. The production history you dig up has been fascinating. I will never look at the clowns the same way again. I have to admit that this isn’t one on my favorite films, although I do agree with you that ( not being black), the crow scene never offended me – it didn’t occur to me that the crows could be taken to represent African Americans until it was pointed out to me, in fact. I think the reason I didn’t like it is for the same reason I don’t like Chicken Little – everyone is so mean to poor Dumbo! And his mother faces such serious injustice! It just makes me feel gross to watch a baby treated so badly. The fact that this movie makes me cry (worse than “Up”), is actually a positive for me, and keeps this movie from ranking down at the bottom of the barrel. The Pink Elephants song is one I have to diagree with you on. Its origins (drunk baby) isn’t funny, and the surrealism doesn’t fit the to be of the rest of the movie to me. It also strikes me as creepy and scary for young children. Overall, this movie gets a C rating in my book.